We haven't long moved back to Northern Ireland from South West Scotland, and thought it was about time to dust the cobwebs off the fishing rods. Unsure of fishing marks around the area, we decided to take a three and a half hour drive to Killybegs. We drove along the coast taking in the wonderful scenery, when we spotted a wee quiet secluded beach with a car park and a toilet, to which we later found out was called Muckross, so we decided to fish this venue. Muckross, stunning beach and not an angler in sight! The weather was sunny, clear blue skies with a bit of a breeze along with an ebbing tide. Chris, the other half decided to have a wee competition. Most fish wins, so we set about getting our gear ready to fish. I fished with a Sonik 16ft continental rod with a Penn Affinity fixed spool loaded with braid and my husband fished with a Trabucco Xandria with a Grauvell fixed spool, also loaded with braid. We used 2 and 3 hook flappers with size 4 hooks and I had a few luminous beads above the hooks for an attractor. As we were not familiar with the venue we took a selection of baits including rag worm, mackerel, sand eel, squid and peeler crab. Chris went straight for the rag worm tipped with mackerel and cast 60 to 70 yards out, I went with two small strips of mackerel and cast about 40 yards out. Within 10 minutes there was a bite on both rods! I got all excited as it had been a long time since I had seen my rod dance, and even more excited when I had reeled in with a double shot of turbot, as this was a new species for me! Chris had caught a turbot and a flounder. We switched and changed baits but it was back to the mackerel, it was the only bait the fish were really coming to. The fishing continued for a good two hours and there was plenty of fish to be had, even a few good missed bites. We decided to call it a day as we had a long journey home, I was winning our competition by one fish! As we were tidying away our rubbish and other tackle I glanced at my rod, and what a bite I had! I thought to myself "oh yes, big fish to end the day". I couldn't sit on my hands, and reeled in straight away with a nice size turbot. The day ended on a high with twenty seven fish caught, beat my husband, a new species to my collection and all fish returned to fight another day. We decided to go back two weeks later for another go, but this time we went to the right of the beach over the hill and down onto a concrete platform. It was the same set up as before with rods, traces and bait. The weather was slightly different, it was hotter with gusts of wind every now and again and the tide was flooding. I ended up with several small turbot and dabs, the longest being 31cm, chuffed again as that was my biggest dab caught. Chris set up to do a bit of spinning as the water was slightly deeper and there were rocks to the right of us. He spun with sand eels and landed himself several small pollack, the largest being 40cms. We decided to call it a day as the wind was picking up, we ended up with seventeen fish, was happy there were no blanks and all fish returned. We look forward to discovering more fishing marks around the coast and adding to our own personal species count. 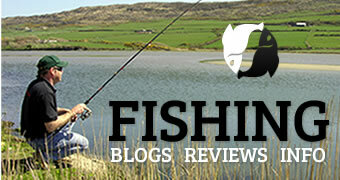 Our next adventure is to Belmullet were we hope to give you an insight to our trip and what we caught.